It’s July folks… how did that happen? I knew that June was going to be a whirlwind of a month. I was right. June definitely kept me on my toes, and I have a lot to share with you on that, but for now, I’m going to indulge in a few days of relaxation and simply leave you with this little recipe that you might enjoy for your 4th if, like I do, you have a kitchen simply overflowing with berries. I had fun making this two berry cobbler look like a flag, but there really is no need to separate the berries in this dish. The juices all run together anyway and the flavors meld beautifully. And, speaking of juices, this is a very juicy cobbler. If you like yours a bit thicker, feel free to increase the thickener a bit. But as it is the berry juices have a lovely velvety mouthfeel even though they run all over the plate. This recipe comes in two parts. The first is the biscuit, which I swapped out with my favorite scone recipe instead. 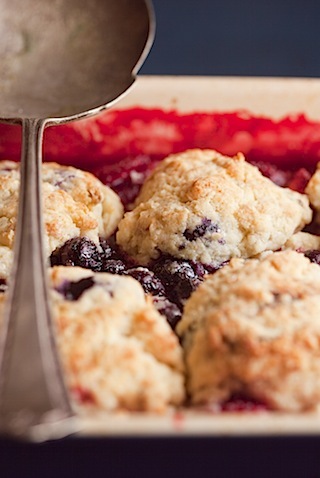 Scones topped cobbler? Yes please. The added bonus here is that I mixed in a few more blueberries into the scone batter for a beautiful look as well as added flavor. Anyway, make the scone batter up until the point that you are going to roll it out, and then set aside while you prep the berries. 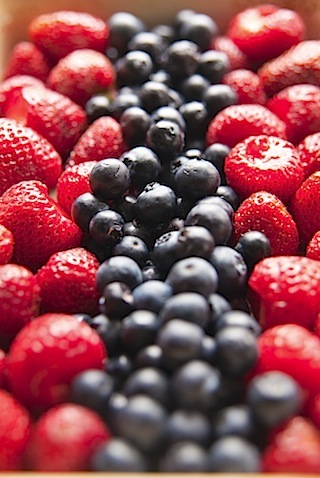 Take clean and de-stemmed berries and place them into your baking dish so that it mostly fills it up. Then, take the berries back out of the pan, and stir in a couple of tablespoons of sugar, a pinch of salt, and about 2 teaspoons of the thickener of your choice (I used cornstarch). You’ll need to use your judgement on the amounts here, since your pan and berry size may vary. I used about 1 1/2 pints of smallish strawberries and about a pint of blueberries with those quantities. If you like, splash in some vanilla. 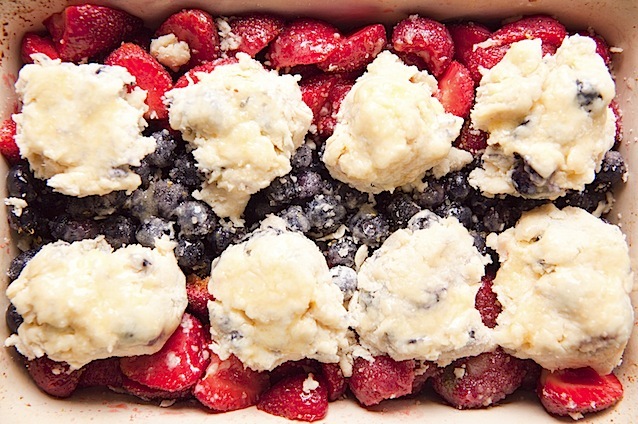 Place the berries in the baking dish, and then sprinkle with another tablespoon of sugar and the zest of 1 lemon. Then, drop on the scone batter. You can form them into small scones if you want and place them, or simply drop rough dollops, about 1/4 cup each. Brush with melted butter, and bake for about 30 minutes at 375F until the scones are lightly brown and the fruit is fiercely bubbling. Let cool slightly before serving. This entry was posted in Cook and Eat, Desserts, Food, Recipe, Sweet, Vegetarian. Bookmark the permalink. 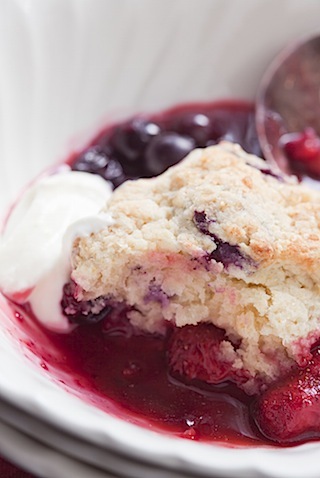 I always love a good recipe that incorporates fruit 🙂 It would be interesting to try the biscuit topped recipe as well… but I think you made the right choice with the scone topping considering that it’s so juicy on the bottom. June always seems to be a busy time of month for some reason- I know mine flew by! I’m such a huge fan of your work. Your photography is incredible and the recipes are fantastic. I don’t know why I it took me so long to comment, but I’m sure it has more to do with being lost in studying your photography. I just purchased my first SLR 3mos. ago, so I’m continually in study mode. That said, your work in so inspirational! Beautiful! 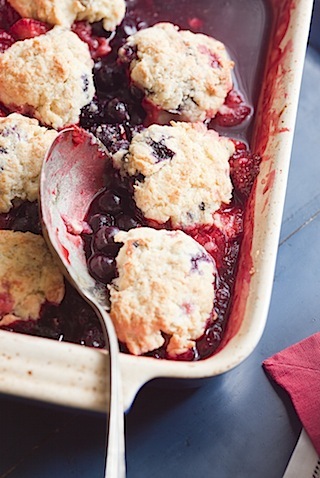 Cobblers are perfect with berries. I love the fact that its full of juices just makes it seem fresher and truly rustic. very beautiful..and delicious:-) nice to meet your blog! the dish was gone before I could say in Berries. Our Hay Day cheatsare unique versus others; you will certainly not need to be jailbroken to use our cheats. Getting Coins as well as Diamonds on Hay Day should not be a discomfort in the a$$ or discomfort for your pocket.